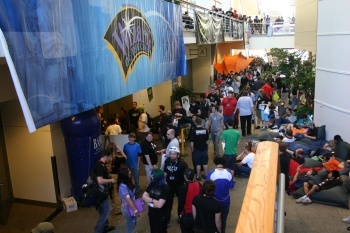 I've got bad, yet inevitable news: passes to the 2011 incarnation of the Penny Arcade Expo are now sold out. That's according to no less a source than the official PAX Twitter account, which coldly offers neither compassion nor alternatives for those gamers hoping against hope for a reason to trek to Seattle this August. The PAX website however, is a bit more helpful. Though it flatly denies the possibility of a secretive stash of tickets to be sold at a later date -- take that as you will -- it does offer a slight glimmer of hope in the form of a forum thread dedicated to people selling the tickets they've already purchased. As the site warns, caveat emptor, but if you're dying to attend, it's a far better option than criminal trespassing. Most interesting to me is how successful PAX remains, despite the relatively recent "Dickwolves" controversy. Whether this indicates that the Penny Arcade boys have made good with their accusers or if the Internet blew the reality of the situation out of proportion is in the eye of the beholder, but either way bodes well for those hoping to attend a gaming convention sans press credentials. That reminds me; if you're still desperate to get into PAX 2011, there's always the slightly more involved third option: start your own gaming website! You'll probably have to learn rudimentary HTML code, and you might have to wear a robot helmet, but if successful, the rewards are totally worth it. No, not money. Running a gaming site will completely bankrupt you. In the meantime however, you'll likely get some huge t-shirts and an amusing anecdote about Cliff Bleszinski.